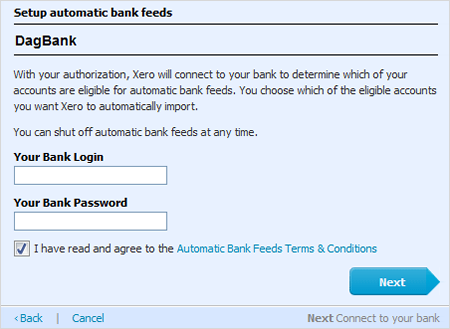 Bank feeds automatically import account transactions into Xero from your bank. Once the feeds are up and running, you’ll no longer need to download and import bank statements to get transactions into Xero. There are two main types of bank feeds. Where you bank determines which type of feed you can use. 1. Enter your online banking login and password details, then click Next so Yodlee can connect to your online banking site. 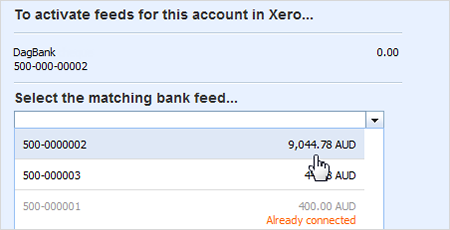 Add your account number in Xero, by going to Accounts >Bank Accounts and clicking on the Add Bank Account. 2. Click on the ‘Get bank feed’ button. 3. Enter your online banking login and password details, then click Next so Yodlee can connect to your online banking site. 4. Find your account on the Bank Accounts screen and click the Start Bank Feed Now button. 5. All accounts you access through online banking using the same login details appear. Select the account you want feeds from. Yodlee feeds need to be manually refreshed, so we would recommend using direct feeds if your bank offers this (see list above). Go to Accounts > Bank Accounts. Find the account you want to refresh the bank feed for. Click Manage Account, then click Refresh Bank Feed. Make sure you stay on the same screen while refreshing the feed. Changing screens may interrupt the connection with the bank and your refresh may fail.